Florida’s controversial move to end teacher tenure and tie educator pay to student performance in 2011 likely caused a modest improvement in student test scores, according to research published by the Brookings Institution this month. While the overall benefits of the policy were slight, the authors conclude, the lowest-performing students experienced the greatest gains in achievement. The study is the latest to examine the effects of paring back employment protections for school employees, who have traditionally enjoyed rare job security. Studies of tenure reform in huge school districts like Chicago and New York City have shown that allowing principals more leeway to fire teachers in their probationary period (typically the first three years of employment), or to extend that period rather than grant tenure so quickly, can lead to a decline in teacher absenteeism and prod lower-performing educators to leave the profession. On the other hand, a study of similar policy changes in Louisiana found that making tenure harder to achieve and easier to lose may have led to the exit of more than 1,500 teachers. Some have also argued that offering administrators the right to fire ineffective employees doesn’t mean they’ll exercise it, and that retaining the best teachers is more important than counseling out the worst ones. The Brookings report, written by Northwestern professor David Figlio, University of Tennessee professor Celeste Carruthers, and Georgia State professor Tim Sass, studied student performance on standardized tests following the 2011 passage of Florida’s Student Success Act. Before the adoption of SSA, teachers in Florida were fireable without cause within the first 97 days of employment; if they received satisfactory evaluations over their first three years (99.7 percent were rated satisfactory in 2009), they were signed to a “professional services contract” that made them difficult to terminate. The new law mandated annual contracts for teachers hired after July 1, 2011, with renewal conditioned on regular evaluations that are weighted heavily toward measures of student test score growth on state exams. Using statewide scores from the Florida Comprehensive Assessment Test (the state’s primary assessment until 2015) between the 2007–08 and 2012–13 academic years, the researchers compared student performance at schools more affected with those less affected by the SSA. Though all schools across Florida were subject to its requirements, some employed relatively more rookie teachers — whose employment status would hinge the most on the new reforms — and some evaluated a higher percentage of their teachers in the initial years. Overall, the study found that in schools where the SSA was felt more forcefully, students performed incrementally better in math and reading on the FCAT test. 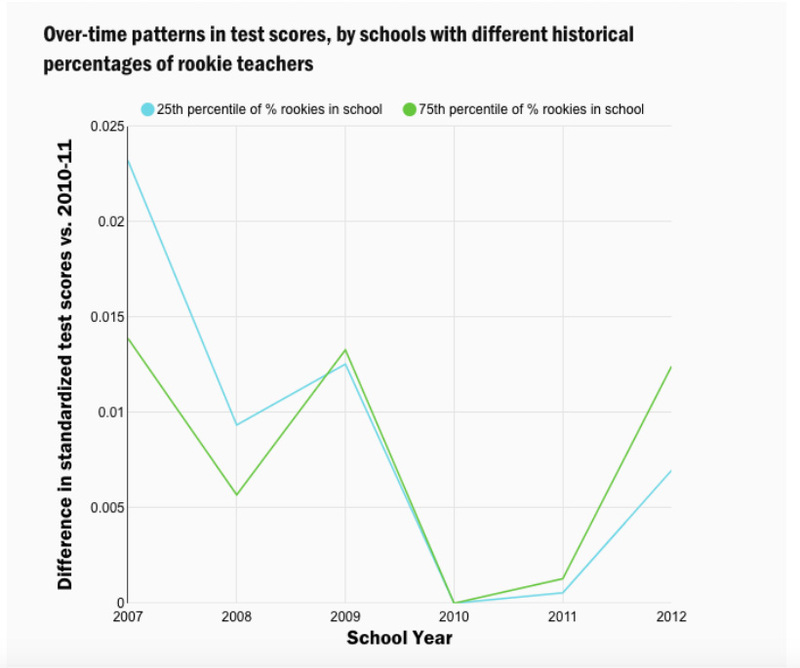 Scores on the test were declining for all schools in the years before the law’s implementation and recovered ground after 2011 — though the authors note that these trends were small enough that they could simply represent a smoothing-out of data over time. In schools that evaluated more teachers, and in those with relatively more rookie teachers (7.6 versus 3.2 on average), improvements in scores were proportionally larger than schools less affected by the SSA. 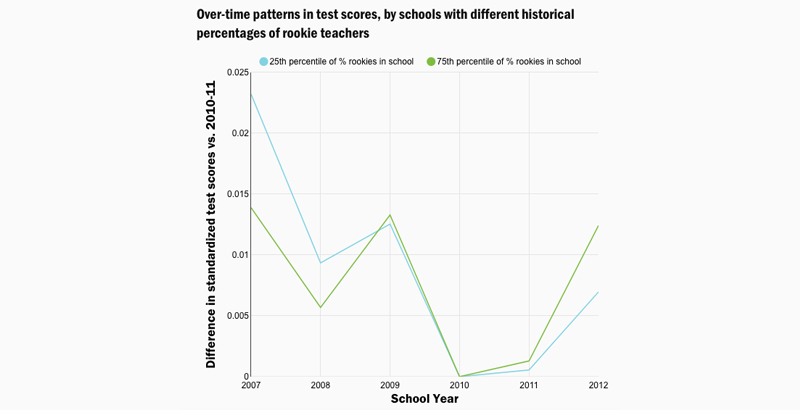 Schools that employed higher percentages of rookies, whose overall student performance had lagged those with more experienced teachers in the years before the change in law, outperformed them in the years immediately following the end of tenure. What’s more, students who had previously performed the worst on the test made the biggest improvements. When sorted by scores into separate quintiles, the differences in scores between the most- and least-impacted schools were the largest among students in the bottom quintile. The authors do caution that the picayune size of the effects should be taken into account. The findings are especially bullish when viewed alongside Florida students’ eye-opening growth on the National Assessment of Educational Progress, which has occurred at almost exactly the same time that the SSA has taken effect. While national NAEP scores have remained disappointingly flat over the past decade, Florida has won the kudos of Education Secretary Betsy DeVos for its decade of improvement. Education figures to be a defining issue in this fall’s U.S. Senate race between incumbent Democrat Bill Nelson and his challenger, Republican Gov. Rick Scott, who pushed to pass the SSA in the first months of his administration. Scott has been quick to take credit for Florida’s recent gains, though he has also been bitterly criticized by the state’s largest teachers union. In the meantime, national reformers will debate the results of the Brookings study, and particularly the use of test scores as an achievement metric. Any improvement to student performance will be welcomed regardless of its size, though the controversy attached to changing public employee contracts makes it a politically costly tactic. And other new research indicates that limiting job security could make teaching a less attractive career.